We left Kathmandu 2 days ago. 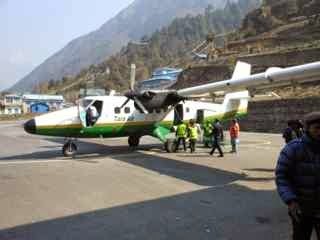 We flew on a 2-propeller plane from Kathmandu to Lukla. Apparently this is rated the most dangerous airport in the world. Why? Well, on landing in Lukla the runway is slanted up to slow the plane. Furthermore the airstrip is extremely short and located on the side of a mountain. Apparently on take off from Lukla the plane goes off the edge of the airstrip, free falls for a moment and then starts to rise. We can’t wait. The hiking started right away. The first day we covered 15km and dropped down into a valley and then rose right back up. We hiked for approximately 4 hours with no vertical gain to show for it. We did however accomplish ~3500 feet of elevation gain, if we just count the up hills. It was an incredible hike. Aadam, naturally led the pack – that kid is in incredible shape! I did not hear a single word of complaint from him. We spent the night at a rustic lodge. Our room was the equivalent of a garden shed. No heating, minimal lighting, basic bathroom, etc. That being said by local standards it was quite luxurious. The following morning we set off again for a 3 hour hike. This time we only covered 3.7 km, but it was all uphill. We travelled almost 3000 feet vertically up. Again Aadam and Seth (Sanjay’s son) led the pack. So what did we see – lots of Sherpa people and culture, beautiful mountain ranges, lots of yaks and horses, Sherpa porters carrying incredible amounts of weight up and down the mountains, and unfortunately lots of pollution. There is a fair amount of litter on the trails. I have made a mental note that on our descent we should devise a garbage pick up devise, attach a garbage bag to our packs, and get to work. We have heard so often of how energetic we will feel on the descent- lets put some of that energy to good use. The boys are sleeping right now – a quick nap before dinner and a presentation by David Breashears. He will be speaking of his expeditions to Everest, but also about the 16 Sherpa who died on the mountain this year. David has been engaged by the Sherpa to negotiate with the foreign expedition teams as to how to proceed. David is highly respected in these parts. David has generously agreed to provide Aadam with an internview about the Sherpa that Aadam will bring to share with his class. (I have to admit, I am so proud of Aadam for sitting down at the end of a tough day of hiking and doing his work each day). He also is actively soliciting opportunities to learn about the Sherpa. I am continually amazed by what Aadam is capable of. He is incredible!